Would Bloomberg Have a Chance? The national political press corps has plenty of reasons to be fascinated by the prospect of (newly) independent New York City Mayor Michael Bloomberg running for President next year. First, the press likes Bloomberg himself  he's one of us (just a tad richer), having earned his fortune running his eponymous media company and many of the biggest players in New York and Washington media circles are chummy with the dinner-party-charming Mayor. 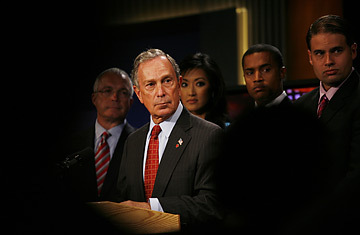 Most of the obvious attacks on a Presidential candidate Bloomberg would come from the right. Conservative activists would assail his views on gay marriage, the death penalty, gun control and taxes as typical New York City liberalism. Both sides would say he lacked national security experience and explore his background, looking for business and personal vulnerabilities. Bloomberg would try to fight off the efforts to define him with hundreds of millions of dollars of television commercials, and would likely spend a similar amount trying to define the other candidates as out of touch and extreme. Clearly Bloomberg does not plan to enter the race until he sees whom the major parties settle on as nominees, likely early next year. At that point, he would look to see how unfavorably those two candidates are seen, how sour the mood of the country is on politics-as-usual, and how open the electorate seems to a candidate Bloomberg himself describes as "a short, Jewish, divorced billionaire," one who has now turned his back on both the Democrats and the Republicans. And here's the thing: Bloomberg will only enter the race if he believes he has a reasonable chance to win, but he almost certainly never will be the favorite to win, simply because as an independent he could not be expected to get more than, say, 35% of the vote at best, requiring the political equivalent of drawing an inside straight to win the necessary 270 electoral votes to take the White House. Even H. Ross Perot, despite taking a respectable 19% of the popular vote in 1992, couldn't win a single electoral vote.